As I mentioned in my previous post for my Art strategies final project I wanted to continue working with systems art and traffic routes. In this case we were also asked to consider a critical use of spectacle in our work. In my mind Times Square stands out as an intentional spectacle. To millions (billions?) of people this place and the image of it represent New York City. However if New York City is a spectacle in in itself, as I believe, TSQ is a fairly poor representation of that. My goal with this final project was to make a sort of Times Square-esq spectacle out of the lives of real individuals who live here. 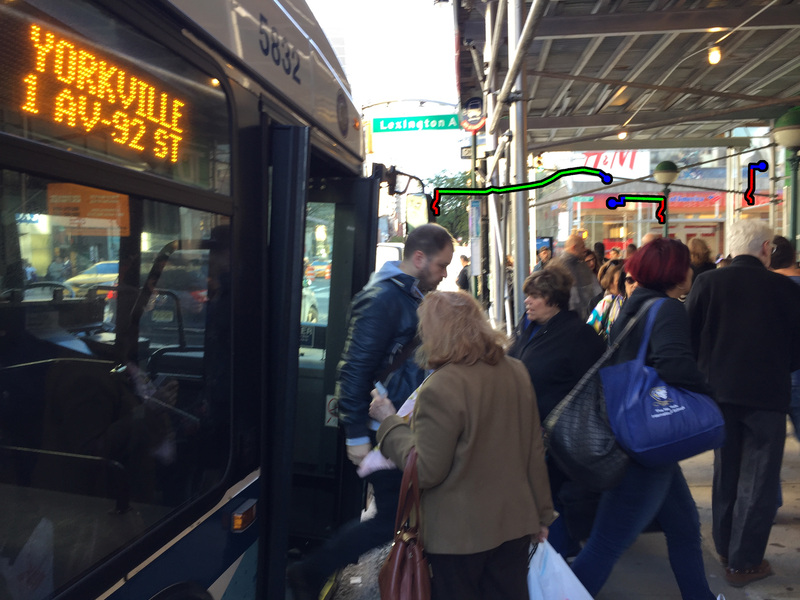 To make a truer representation of NYC. To make the case that the city itself, and the people and places who make it are where attention should be paid, rather than the baubles set up for visitors. Basically, I wanted big lights for the big city that said something other than “buy American apparel” and “share this with your friends”. The final vision for this project entails a large canvas that moves to various buildings/locations throughout the city and documents the travels of regular visitors/residents. 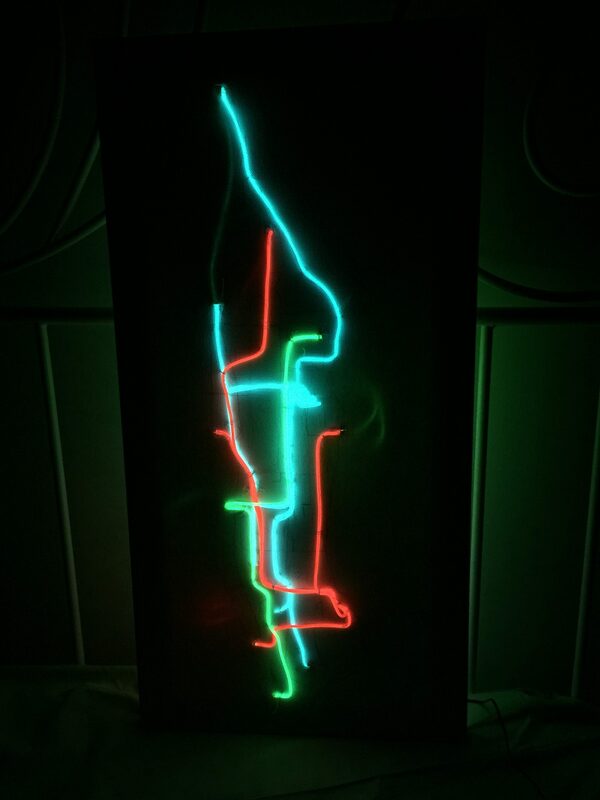 At each location a map of New York is projected onto the canvas and the various destinations and routes are traced in EL wire (or some equivalent lighting technology). Hopefully this can be displayed in a common area, like a lobby, as that buildings routes are being added. As the canvas moves to new locations in different neighborhoods the routes begin to crisscross and pile up, creating a realistic representation of density and interconnectedness of otherwise disparate personal paths. Ideally each origin point (where the work is temproraily displayed) and it’s respective routes would be represented in a different color so that they are distinguishable across the map. Each line would also be set on a timer to light up at the rough start time of each commute/journey, stay on for the usual duration of this trip, and then turn off. 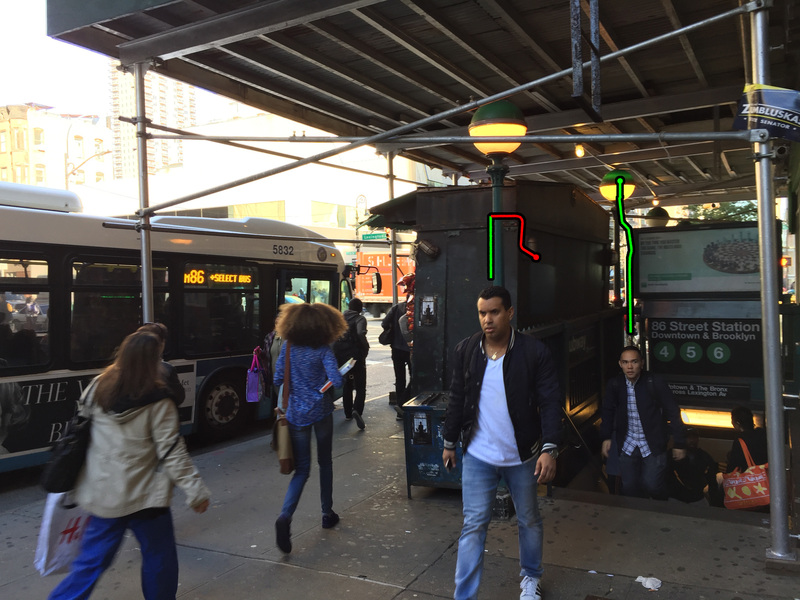 This creates a cyclical, blinking, light up board that creates a similar visual effect to TSQ advertisements. 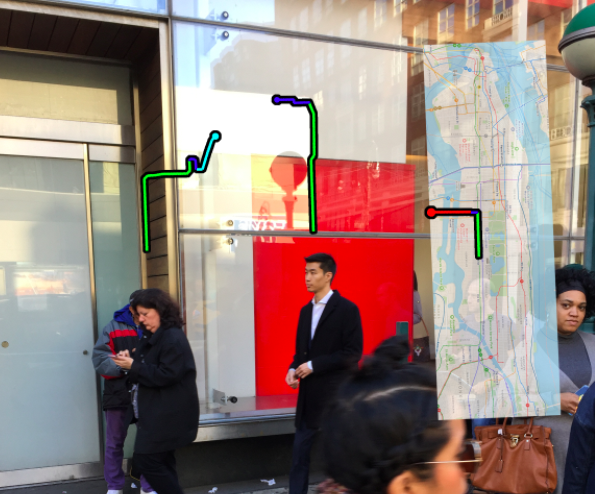 The piece would stop traveling to different buildings and neighborhoods once a map/image of New York is easily recognizable through EL wire alone. A major concern with this work was making sure I use a system to select which buildings I would set this up in, and what order. At this point I think It would visit and map from buildings in each of the city’s 59 community districts (which roughly correlate with neighborhoods) and the order of these would be selected randomly. Within each neighborhood I think I would try to identify buildings that are within the median height, use and age for the neighborhood and find property owners or residents from that list that would be accommodating. Basically I want to work in a typical building for each neighborhood. I would then trace the paths of as many people as volunteer within each building, I may also pay participants for their involvement. 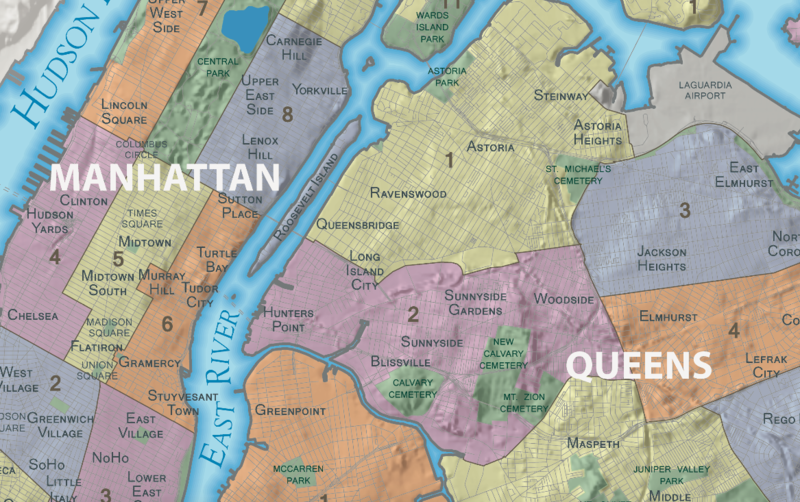 Ultimately I think this map will include trips to work, school, grocery stores and doctors offices and will involve a wide enough spectrum of people to be familiar to the vast majority of NYers. The process of this work can also be repeated with different building selection, cities, and should be relatively easy for an “unskilled” person to complete so theres a lot of opportunity for iteration in this work. I like this project because it literally highlights the ways in which mundane individual decisions, together, build the tremendous spectacle of The City. I’m going to post a sign up sheet in my building to collect some real destinations but failing that I’m going to try to make them up based on real data. Like a neon sign for beer in a bar window. This is what this apartment building has! I think of this as presenting a “chicken/egg” question in reference to housing, place and identity or the idea that the destinations construct the origin. 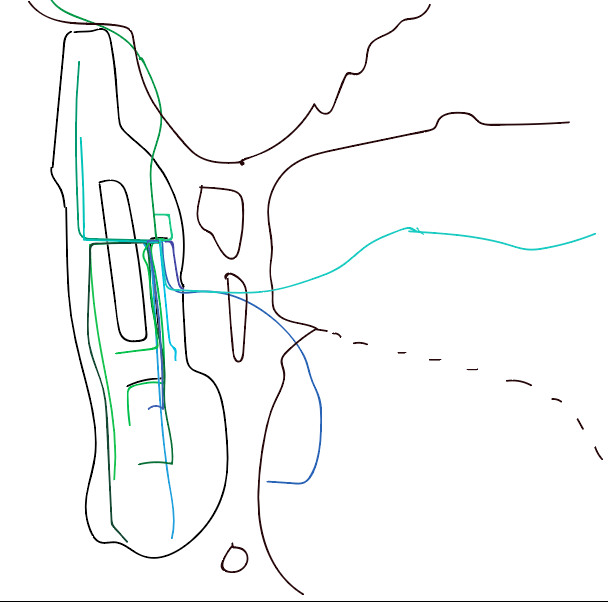 Visualizing individual routes in the same way we might view subway lines is interesting to me – its sort of like using a microscope on urban transit issues. I’d like to make a series of these on the same canvas. I think it could be really interesting to add new buildings and their associated routes to this over time. It would create multiple hubs and interwoven spokes that would make the people flows more distinct and make the broader system I am referring to clearer. This is especially interesting with no base map. How many buildings would I have to add before the form of New York becomes obvious? 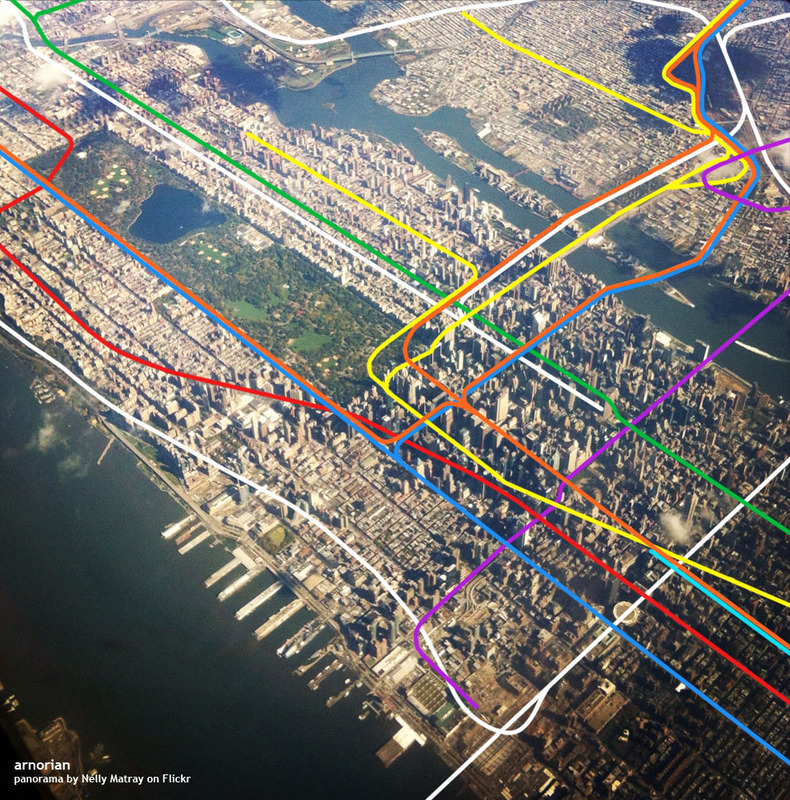 Is New York defined by the paths we carve through it? How big should this be? Would other interactivity add anything to this? How do I solicit this information from my neighbors? Are there questions I need to ask myself about this? I Initially had a hard time coming up with something for this assignment. 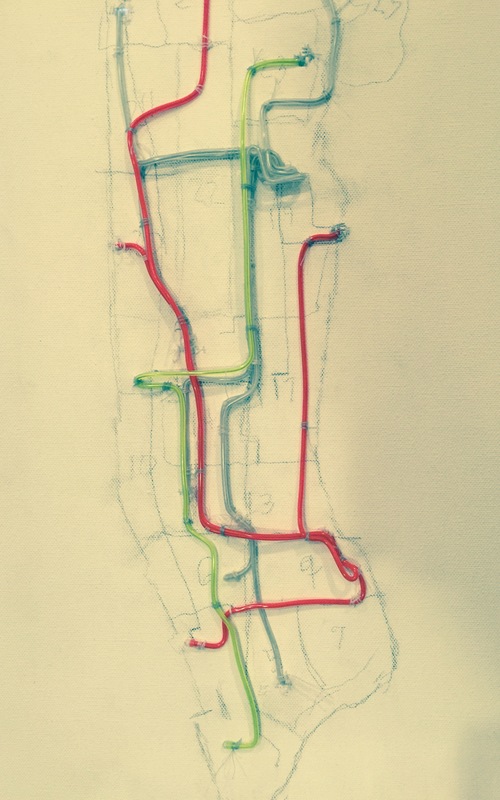 However ideas started forming when I took the subway home one night during rush hour. The 4 train was totally packed heading up to 86th street from Union square and a group of people who ~behaved like tourists~ got on towards the front of the car. They were clearly very entertained by the crowded car and started trying to position their phones for a selfie that would also show the crowd. I was kind of irritated by this. While its somewhat rude in general to take a picture of someone without permission I thought this was kind of adding insult to injury. Most of the people on that train were not interested in entertaining guests when they stuffed themselves into an overcrowded train after working all day. I thought about this dynamic for a while and came up with a few iffy concepts. Eventually I casually asked someone what they might do for a performance art project. They said they would probably just film themselves “performing identity”. I don’t think they were being completely serious but it really got me thinking about why I was bothered by the people taking pictures on the train and the sort of identity performances I go through on a regular basis. Once such recurring performance I’m very aware of is my identity as a native New Yorker. In retrospect I think this is why the tourists on the train bothered me the way it did; I feel entitled to New York and I resented them for staking a claim or having an opinion without my understanding of context. I recognized this attitude as something that should probably be challenged or investigated and I decided to work my project around that. What I decided to do was travel through the major tourist sites in manhattan for a day and share my trip primarily on snapchat. I think in someways this is an act of jealousy. I didn’t think it would be realistic or believable to pretend I was actually seeing New York for the first time so I decided I would just consume the image of New York the way the visitors do. While looking into performance artists I noticed an association with flash mobs and starting reading about them. 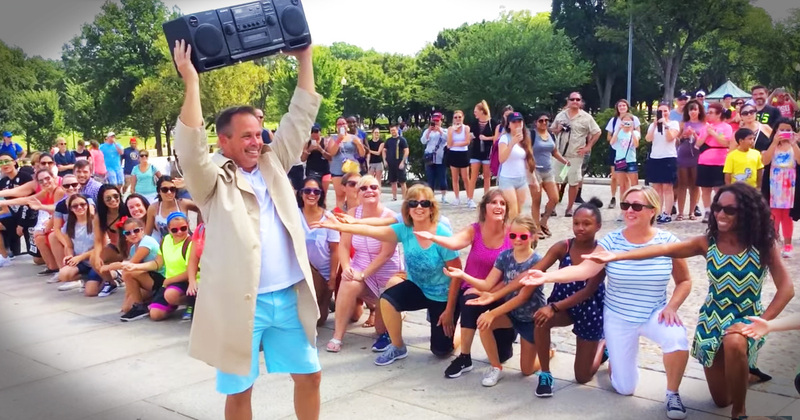 Surprisingly I found that the “flash mob” concept was “invented” buy an editor for Harper’s Magazine named Bill Wasik; In his own description this was meant to be a social science experiment. However, after reading this week’s reading by Lucy Lippard and Wasik’s own description of the event It seems to fit in the cannon of performance and conceptual art. The first flash mobs were organized by Wasik in 2003 via email chains. It seems that the basic concept was a criticism of a hypocritical conformist culture. Wasik makes clear that much of the project or “experiment” was meant to stoke the vanity of his participants by creating a sense that their special knowledge and conformity gave them a form of power over others who were out of the loop. Often it seems these displays of power were deployed in a self-ridiculing way (Wasik seems to have some contempt for the “hipsters” whom he considers his participants), such as the first successful flash mob which took place at the Herald Sq. Macy’s. 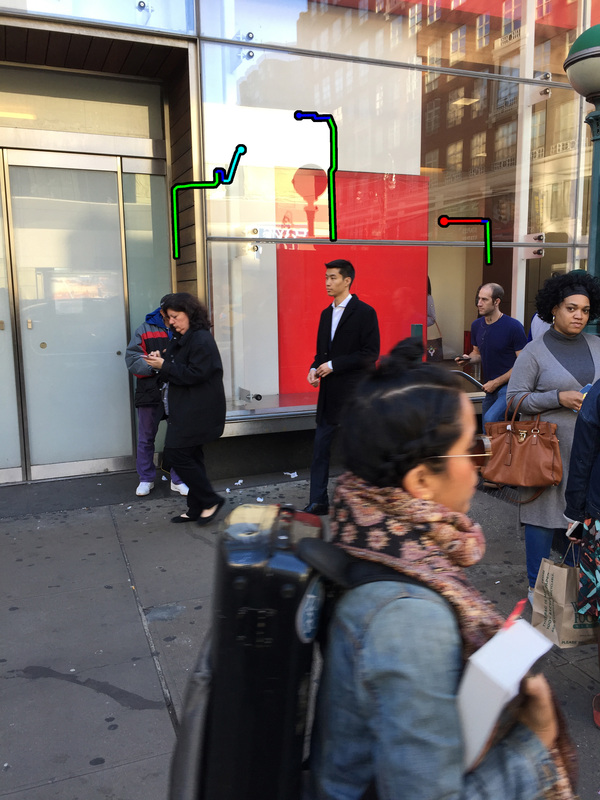 In this case a large group following instructions quickly grew around a specific rug in the Macy’s show room and explained to staff and passersby that they were a collective from Long Island looking for a “love rug” and had to make the decision as a group. Wasik says that a major inspiration for this was Stanley Milligram’s body of work. Wasik writes, “The Milgramite tradition in art would be defined, I think, by the following premise: that man, whom we now know to respond predictably to social forces, is therefore himself the ultimate artistic medium”. This reminded me a lot of Lippard’s example of the artist who locked their gallery attendees in an empty room until they attempted to break out or the artist who mailed a list of orders to a dictator. “Milgram relates the story of a young man who had been through the study in 1964 and six years later sent a letter to Milgram telling him that, as a result, he was seeking CO status to avoid fighting in Vietnam. Thinking about technology, economics, and urban geography. I have no strong feelings about bikes one way or the other.